Home > News > Campion Education recognised as world e-book leader! It’s been an exciting week for us! A number of online news outlets have shared the news that we have been confirmed as the world’s largest distributor of digital text books for secondary students. The confirmation came from the five major secondary education publishers – Oxford University Press, Cambridge University Press, Pearson Australia, Nelson Cengage and Jacaranda. It reflects a trend that sees many of our schools increasingly take a digital-first approach to learning. 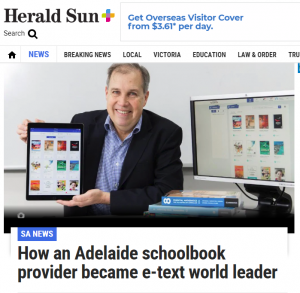 AN Adelaide school textbook and supplies company is being recognised as a world-leader in providing e-books to secondary students across the nation, as more and more schools embrace digital technology over traditional books. Campion Education has grown its sales of e-books into secondary schools in Australia nine fold in the past few years. While Campion’s head office is now in Melbourne, its roots remain firmly in Adelaide where it was established by two local families more than two decades ago. Managing director James Cathro describes the growth in demand for secondary e-book school texts across all subject areas from metal work to languages and science as “exponential”. Mr Cathro says the acknowledgment this month from the leading publishers — Oxford University Press, Cambridge University Press, Pearson Australia, Nelson Cengage and Jacaranda — came as a shock. “It surprised me in the sense the Australian education market is comparatively small … but it tells us something about how far advanced Australia is in that secondary market when it comes to e-books, compared with many other countries,” he said. Adelaide’s Uhrig and Burns families bought the school resource distributor in 1996 while the company was in receivership and have been steadily building it ever since. Mr Cathro estimates the company, which now operates in most states and has several outlets in Victoria and New South Wales as well as a warehouse and shop in Hectorville, is 15 times bigger than it was just over two decades ago when the SA families took it over. It’s corporate office remains in Pirie St and this is where the board still regularly meets and business management meetings occur. “We retain very strong and deep roots in Adelaide but opted to base ourselves in Melbourne simply due to the size of the population in the eastern states,” he said. The company, which employs 140 full-time staff swelling to 1400 casual employees in the lead-up to a new school year, supplies about 3,000 Australian schools and 600,000 students with printed and digital resources, stationery and art supplies. However, Mr Cathro says the secret to his company’s success, which is now also extending into the vocational and tertiary sector, isn’t a mystery. “It’s about sticking to your business and spending inordinate amounts of time with your customers, to understand what their needs are,” he said. He says e-books have come a long way from the “PDFs on CDs in shrink-wrap” stuck in the back of text books of years ago. “(Today) it is way beyond that, it is interactive and includes videos, quizzes and extra extension work … (and one of the most exciting and empowering things is) it can be updated in real-time, so for example, if a volcano erupts, vision can be embedded for students to view in their geography e-text,” he said. Interestingly, Mr Cathro says, while many schools are opting for digital versions of textbooks over physical ones, when it comes to novels, students still prefer a hard copy.